There are a couple of different ways to make a statement in mixed martial arts. A flashy knockout can do the trick, same goes with scoring a massive win over a respected opponent. On Saturday, Anthony "Showtime" Pettis did both of those things against Stephen "Wonderboy" Thompson. Pettis stunned the fight fans gathered inside Bridgestone Arena in Nashville, Tennessee with his amazing Superman punch off-the-cage knockout. It was an instant classic that will be shown on MMA highlight reels for years to come. Anthony "Showtime" Pettis talks with Daniel Cormier about his incredible knockout victory against Stephen Thompson at Fight Night Nashville. Increased energy levels and added mental clarity aren't the only reasons Pettis is a legit contender at 170lbs. Pettis fights only top-tier fighters and Thompson is exactly that. Pettis stuck to his game plan, attacking the legs of "Wonderboy" with vicious leg kicks the entire fight. Those kicks led to the opening that Pettis used to finish "Wonderboy". Pre-fight Pettis said that he believes he is stronger at this weight class and can use his weapons at their full potential when he needs to. Like he did with less than ten seconds to go in the second round of the fight. He surged forward, using the force generated off the cage to catch Thompson off guard with a devastating blow. That punch perfectly displayed that reinvigorated strength that Pettis is talking about. Thompson was instantly unconscious and just like that, Pettis announced that he's going to be a problem at welterweight. 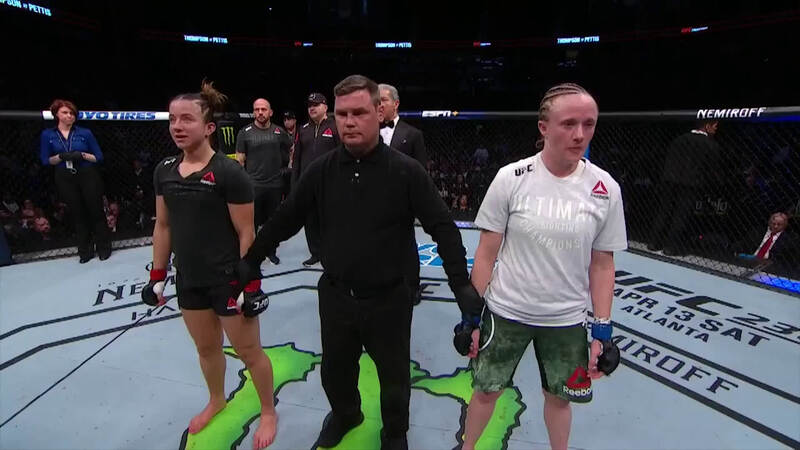 The hype behind UFC flyweight Maycee Barber is real, as the UFC's youngest fighter earned yet another win by stoppage. Barber dealt with serious adversity early and often in her fight with the tough JJ Aldrich, but her power would eventually overwhelm Aldrich. It was a big deal to see how Barber would respond to getting dropped and "The Future" passed with flying colors. The move up to flyweight combined with her high-octane skill set make her a rising star in the division. In the co-main event Curtis Blaydes put on an absolutely dominant performance, controlling Justin Willis from bell to bell. Blaydes needed the win a big way after dropping his last fight to Francis Ngannou. Blaydes also moved himself in front of Cain Velasquez for the most successful takedowns in UFC heavyweight history with (40). Jussier Formiga shut down the Deiveson Figurerdo hype train in a big way. Formiga utilized his grappling to smother the previously undefeated flyweight and it resulted in Formiga leaving Nashville with a win that solidifies him at the very top of the division's list of contenders. The legend of Bryce Mitchell continues. The fighter out of Arkansas earned a huge win after time off from his bizarre power tool injury. He also earned fight of the night honors in the performance. It will be interesting to see what "Thugnasty" does next.